Fleet means quick-moving, and here it is also a made-up word for “FLoored feEET.” Feet on the floor, on defense. If you happen to be a great leaper, your coach may give you a different rule from the one that follows. But if you are anything less, you should follow this rule conscientiously. Never leave your feet on defense, not even to block a pass, not even to block a shot. For every pass you block by jumping, two will get by you, and you will be slow getting to a good defensive help-position because you are not FLEET when you are in the air. You have to wait until you come down to move. For every shot you block, twice you will foul unnecessarily and another time or two the shooter will miss but be able to run by you for the rebound since you can not block out in the air. You have to wait until you come down. A great leaper might be permitted to jump occasionally, and then again a great leaper might just be the guy who needs this rule more than anyone. Because great leapers have the tendency to want to show off their leaping ability, consequently they are frequently in the air and not in good defensive position. By staying on the floor, you stay FLEET, always ready to move, ready to respond immediately to each new position of the ball. Do you have to let people shoot? Of course not. You get a hand in the shooter’s face just like always, and you attempt to distract the shooter, and you try to make him think you are going to jump for his shot. If the offensive player is so clever that, even though you are crowding him and distracting him, he still puts the ball up right in your face and hits that shot consistently, then it might be time to run over to the bench and ask your coach if just once you can put his ball in the ninth row since he has the idea you will not jump under any circumstances. Seldom, however, has there been such a clever offensive player. Even more seldom are there players who can hit consistently from outside when there is a hand always threatening to touch the ball as they bring it up to shoot (and waving in their face as they take the shot). If there is a player that good, most likely he will score on you regardless of what you do! Jumping is not a valuable skill on defense (unless you are a gifted, intimidating center). Even in a defense such as a 1-3-1 trap, it is wise not to jump to try to touch passes. Keep your hands up, forcing lob passes or bounce passes (slow passes) and then be ready to move immediately to get the best possible defensive position. Don’t jump. Never leave your feet. Keep your feet on the floor at all times on defense. Stay Fleet. 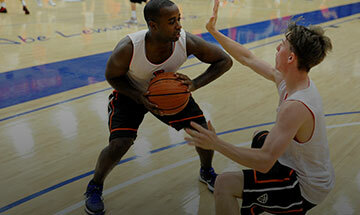 Read More: What should your hands do on defense? Are there exceptions to this rule? Yes. On a last-second shot where there will be no rebound or no new defensive position to get, you will want to distract the shooter as much as possible or even touch the ball, so okay, jump, but make sure you don’t jump into the man and foul him. Jumping is an aggressive move, and referees will be “whistle-ready” when you do it even if you don’t touch the man. “With the body!” referees like to say. The foul was with the body, and that happens most frequently when the body is in the air. In the three-second lane, you or your coach may decide that it is worth jumping to block a shot since the offensive player has only three seconds to do something. Perhaps, even if he does fake you, one of your teammates will have time to get there to jump and block his shot when he finally takes it. If your team has the habit of converging on the man with the ball in the lane, then theoretically one of you could go in the air after each fake, and the shot could never be taken. With or without the exceptions, the facts are that players who are in the habit of leaving their feet are also in the habit of being out of defensive position and in the habit of fouling unnecessarily. Blocked shots and passes usually occur in easy games you would have won anyway, and the success that you feel, the easy layup or the crowd applause will tend to reinforce your jumping behavior and encourage you to do it in tough games where you won’t touch the ball anyway, but your poor defensive position will hurt your team. Most guards should never leap. Keep your feet on the floor. Like it or not, you are not tall. You do not command the skies. Rather than try to show that you can compete with the big boys, stay low and fast and command the floor, getting to big guys’ dribbles and getting underfoot to draw charges. Great leapers should avoid the tendency to show off that ability at the wrong times. Show it off rebounding, not on defense. And on defense, learn to stalk your prey. Slyly wait. Stay in good defensive position, and seek that one great opportunity to block a shot. Then the rest of the game you can get the same result (or even a better result) by simply intimidating but not shot blocking. A missed shot rebounded is more valuable to your team than a shot knocked into the third row. If you learn to stalk your prey and don’t go for fakes very often, you will force a lot of too-quick shots that miss. And you will still get your share of blocked shots on layups and other plays when you see that you can touch a ball after it is already in the air. You are not told never to jump, but to jump less often, only when the ball or shooter is already in the air. Forwards and centers who are not great leapers should concentrate their attention on not letting their man get the ball inside in the lane.